Home » Internet » Are Coffee Shop Wireless Connections Safe? Most coffee shops have free wireless Internet, but are the wireless Internet connections safe? It may not be as important if you just use your computer for looking at websites, but using an unsafe connection can make it easy for hackers to peek into your computer and see what you are doing. 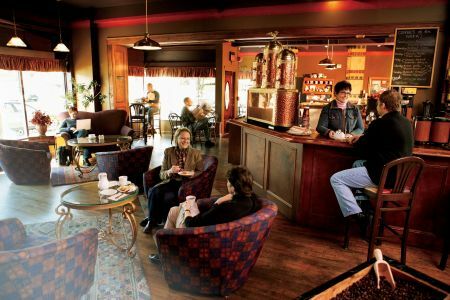 Read this article to see if coffee shops are safe, and what you can do to improve the safety. The best thing about free wireless Internet is that anyone can go on without having to pay a fee. At the same time, this is also a problem. The majority of people will just use the Internet connection to look at websites or talk with friends, but there may be a hacker present that wants to steal information. If you are worried about having information stolen, then see if the coffee house offers any type of protection. If you don’t have to enter a password, then the connection probably isn’t safe. There are a few things you can do to improve the security. Most coffee shops don’t offer an Internet connection that is protected with a password because this tends to be inconvenient. Patrons want to get on the Internet without having to ask about a password. At the same time, a password ensures that the connection is more secure. If there is a local coffee shop that requires a password before signing in, then that one is better to use. There are several common security protocols used to help protect people over wireless connections. These protocols make it harder for hackers to see what you are doing, and they commonly log user activity. That means that the database can be accessed to see who did the hacking. You should look for coffee shops that use WPA or WEP security protocols. You can ask a representative to see if they are using these protocols, and your computer will typically tell you if the protocols are active when you select a wireless provider. A Virtual Private Network (VPN) tunnel can provide you security wherever you go. Most coffee shops will have absolutely no security on their wireless connections, but a VPN service provides the security you need. This service basically puts a shield around your connection, and hackers will have a hard time peeking at your information. You have to pay for this service, but the price will be worth it if you commonly use work computers and devices at coffee shops. You can typically access the service via a browser, and setting up the VPN tunnel only takes a few seconds. Many people use their computer as part of a network. For example, your computer might be set so that it can easily share file with printers and other computers. This opens your computer to outside connections, and that can be very dangerous when you are at a coffee shop. You can turn off sharing in “Network and Internet” on a Windows computer, or in “System Preferences” on a Mac. A firewall is made to keep suspicious packets of data entering or leaving your computer. Most computers have a basic firewall, but you can get more advanced firewalls with antivirus programs. Many advanced hackers can get around firewalls, so this is not going to ensure your safety. At the same time, a firewall is going to make it harder for someone to access your computer. Every website uses an HTTP connection, but this type of connection doesn’t offer much protection. If you want to have more security over a coffee shop wireless connection, then you need to use an HTTPS connection. It is very easy to do this. Just type, “https://” before entering a URL. This will make it more secure. Most coffee shop wireless Internet connections are not very secure, but there are many things you can do to improve the security. Just follow the steps above to make it harder for hackers to access your computer, and you should have no problem when using the free Internet at a coffee shop. Karim Toohalik writes for Brainloop, a company specializing in creating a highly secure workspace through secure online document sharing, information rights management, and other data protection services using the highly secure Brainloop dataroom environment making sharing documents using Brainloop.com easy.